From New York to Dublin, thousands of people donned their best shades of emerald to celebrate the patron saint of Ireland, Saint Patrick. 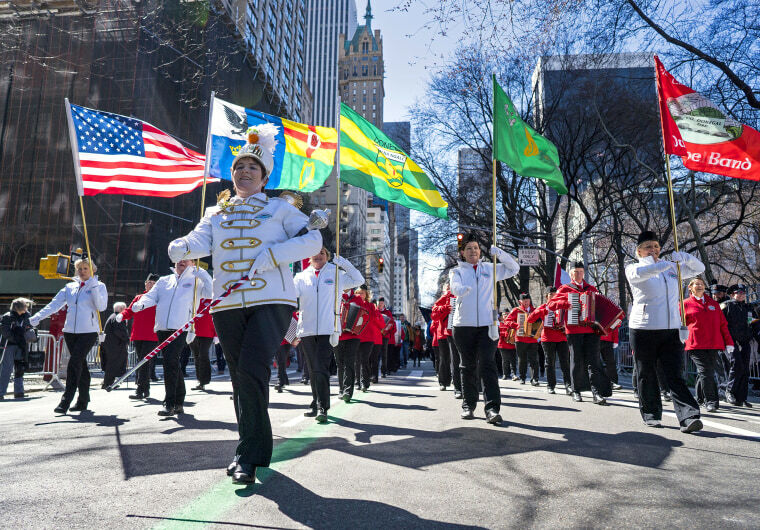 Members of the Dungloe Band unit of Ireland take part in the St. Patrick's Day parade on March 17, 2018, in New York. A big event since the mid-1800s, the parade has been a celebration of Irish culture and of Irish immigrants, who once faced nativist calls for their exclusion from the workforce, and from the country, when they began arriving in the city in huge numbers during the Irish Famine. Boats navigate the Chicago River shortly after it was dyed green in celebration of St. Patrick's Day on March 17 in Chicago. 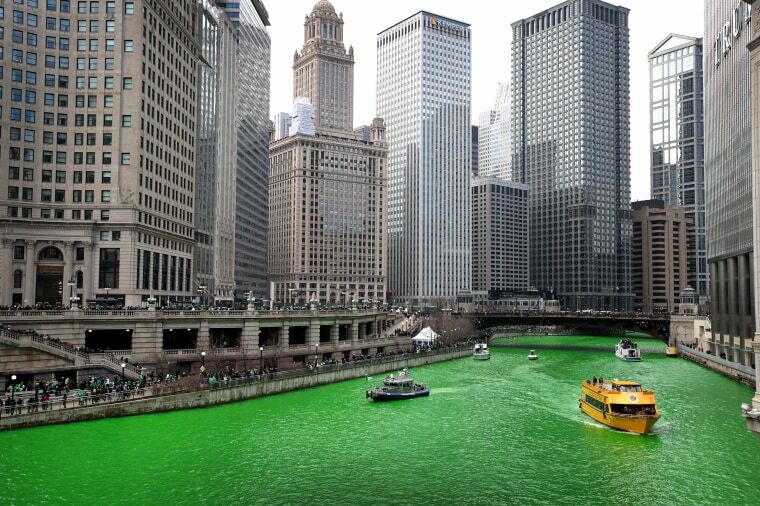 Dyeing the river has been a St. Patrick's Day tradition in the city since 1962. Kelsey Goran of Kennesaw, Georgia, left, kisses a sailor from the USS Alaska as he marches in the 194-year-old Savannah St. Patrick's Day parade on March 17 in Savannah, Georgia. 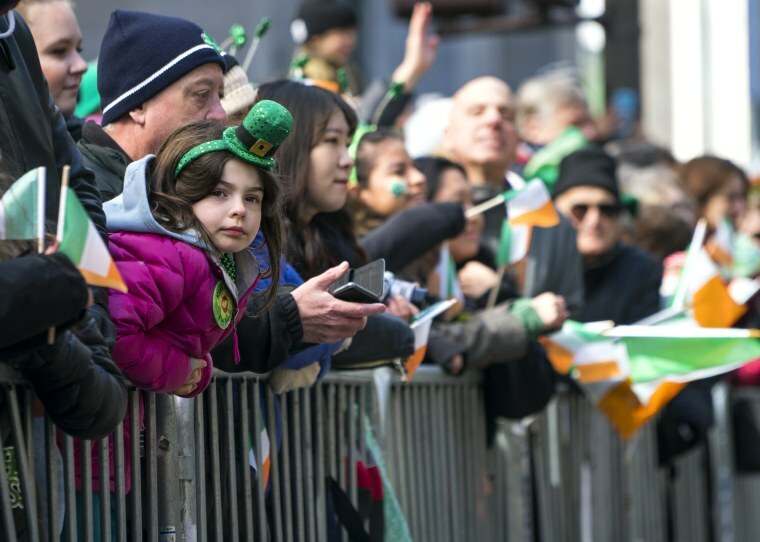 Spectators watch during the St. Patrick's Day parade on March 17 in New York. Several bagpipe bands led a parade made up of over 100 marching bands after Democratic Gov. Andrew Cuomo spoke briefly, calling it a "day of inclusion" and adding: "We're all immigrants." 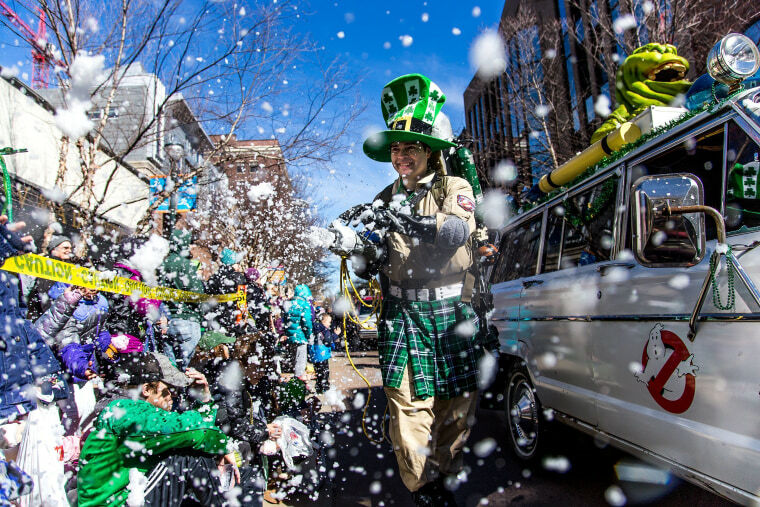 A participant dressed as a Ghostbuster in a kilt and leprechaun hat sprays the crowd with foam during the 18th annual St. Patrick's Day Parade in Kalamazoo, Michigan on March 17. 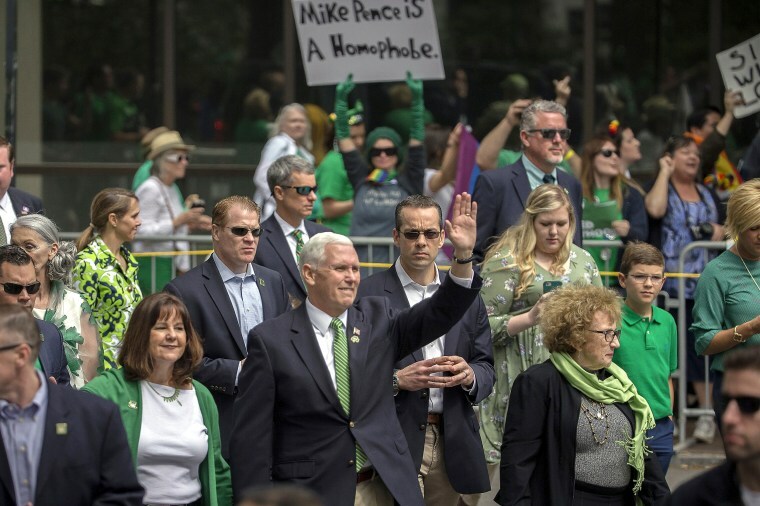 Vice President Mike Pence, center, his mother Nancy Pence Fritsch, right, and his wife Karen Pence wave while walking in the St. Patrick's Day parade on March 17, in Savannah, Georgia. A few lucky fans behind sidewalk barricades got hugs or selfies and a small band of protesters followed nearby waving signs and rainbow flags. Irish immigrants to Savannah and their descendants have been celebrating St. Patrick's Day with a parade since 1824. Fans dressed up for St. Patrick's Day during the third round at the Arnold Palmer Invitational on March 17 in Orlando, Florida. 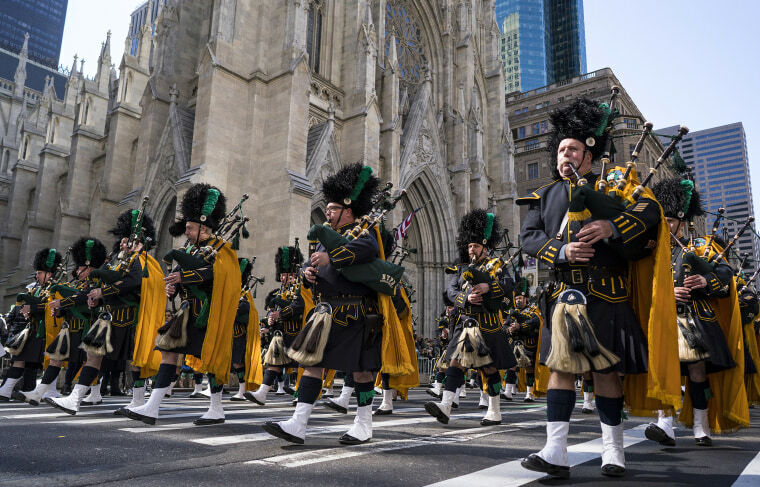 Bagpipers with the NYPD Emerald Society walks past St. Patrick's Cathedral as they take part in the St. Patrick's Day parade March 17 in New York. Irish Prime Minister Leo Varadkar joined along as Manhattan's Fifth Avenue came alive with the sound of bagpipes, trumpets and lots of green during the 257th running of the parade. 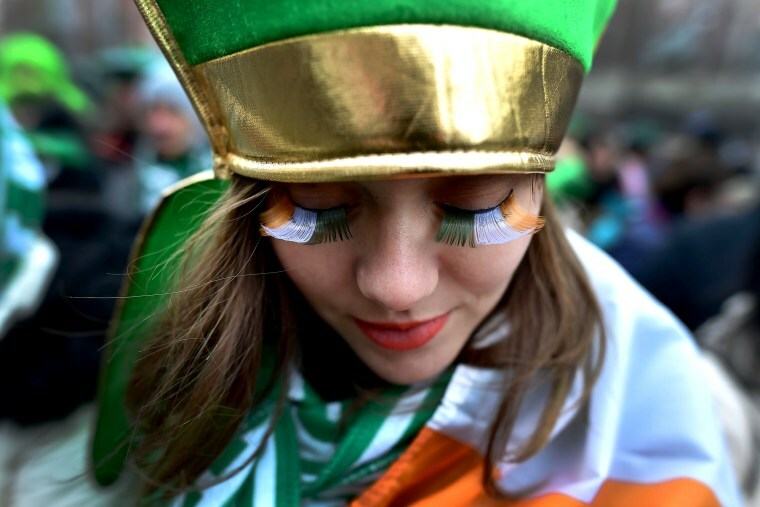 A spectator shows off her green, white and orange eyelashes as the annual Saint Patrick's day parade takes place on March 17 in Dublin. 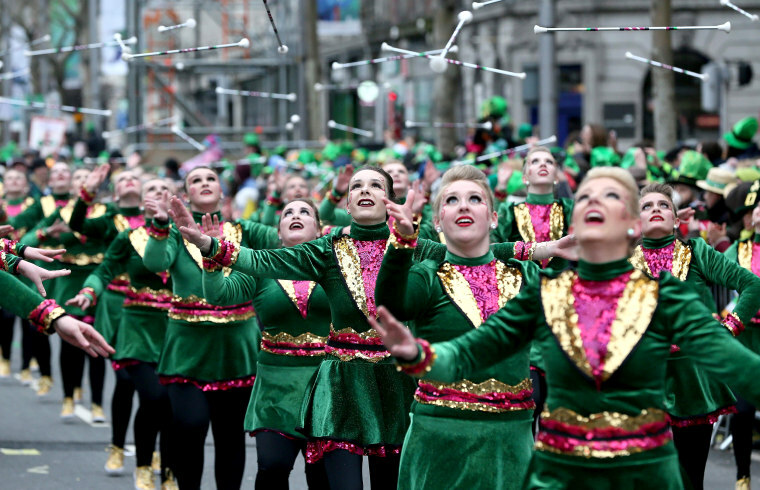 Dublin hosts the largest Saint Patrick's day parade in the world with a route spanning 1.5 miles. The Irish annals for the fifth century date Patrick's arrival in Ireland in the year 432 with the patron saint of Ireland's remains believed to be buried at Down Cathedral in County Down. 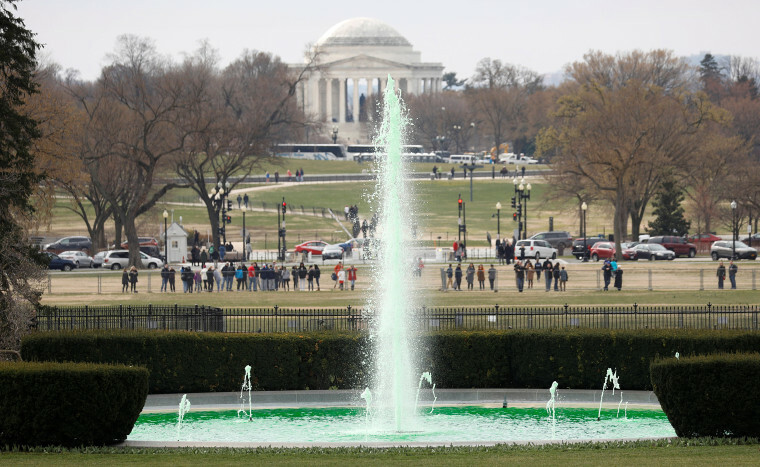 The fountain on the South Lawn of the White House is green for the meeting between U.S. President Donald Trump and Ireland's Prime Minister, Taoiseach Leo Varadkar, as well as St. Patrick's Day in Washington, on March 15. 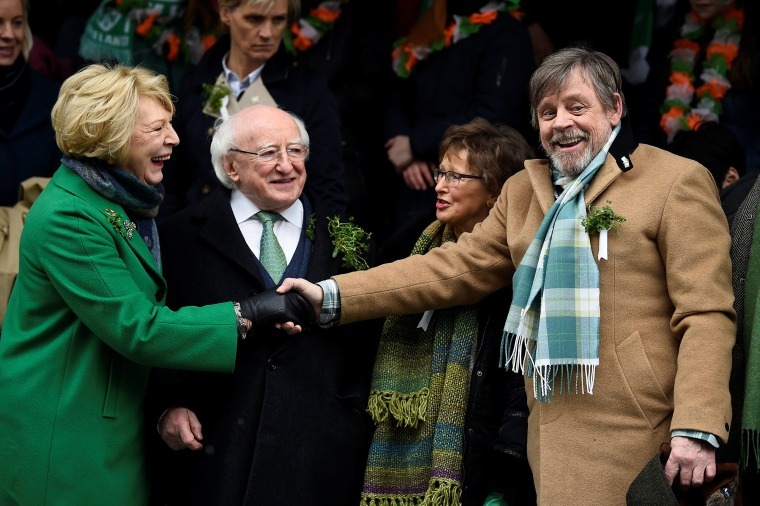 Actor Mark Hamill meets Ireland's President Michael D. Higgins and his wife Sabina at the St. Patrick's Day parade in Dublin on March 17. 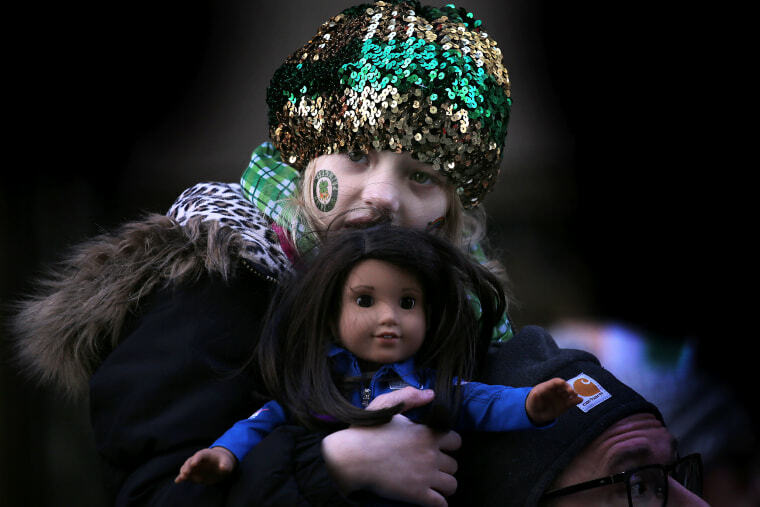 A young girl holds her doll during the 2018 St. Patrick's Day parade in New York on March 17. Catherine, Duchess of Cambridge, attends the St. Patrick's Day Parade with the 1st Battalion Irish Guards at Cavalry Barracks, Hounslow, London on March 17. 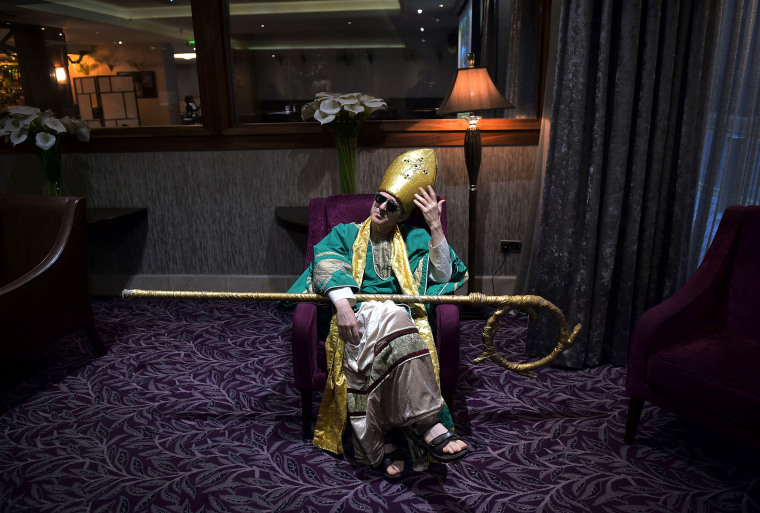 Saint Patrick, played by an actor, gets into character before the annual St. Patrick's Day parade on March 17 in Dublin. 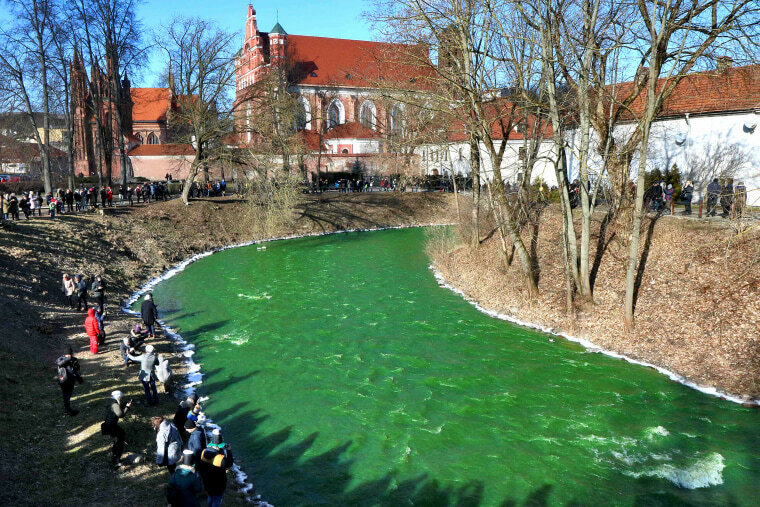 People stand at the Vilnia river that is colored green to celebrate the Irish festivity Saint Patrick's Day in Vilnius, Lithuania, on March 17. 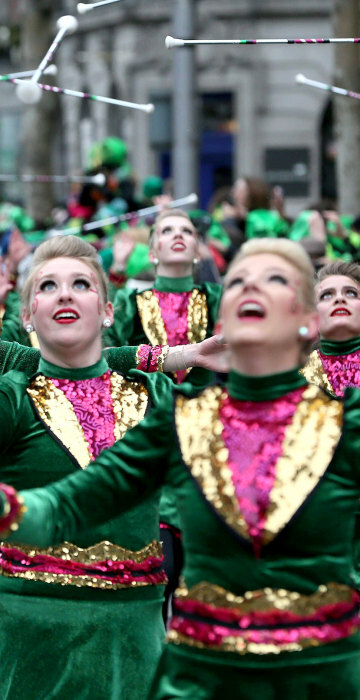 Performers take part in the St. Patrick's Day parade in Dublin on March 17. 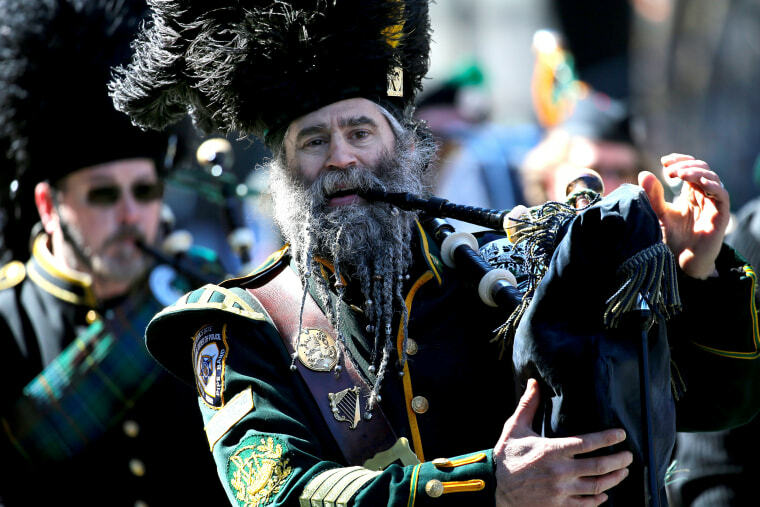 A bagpiper plays during the 2018 St. Patrick's Day parade in New York on March 17. 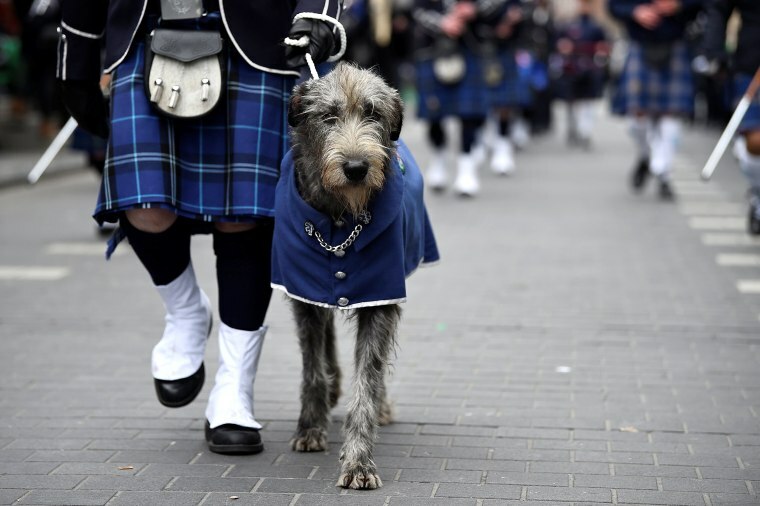 An Irish Wolfhound participates in the St. Patrick's Day parade in Dublin on March 17. 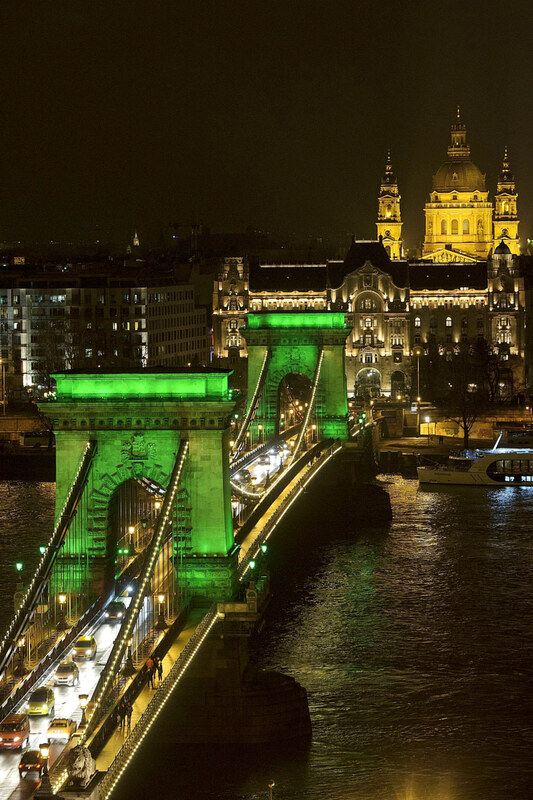 Green lights illuminate the piers of the Chain Bridge for the occasion of St. Patrick's Day in Budapest, Hungary on the eve of Ireland's patron saint's day, on March 16.